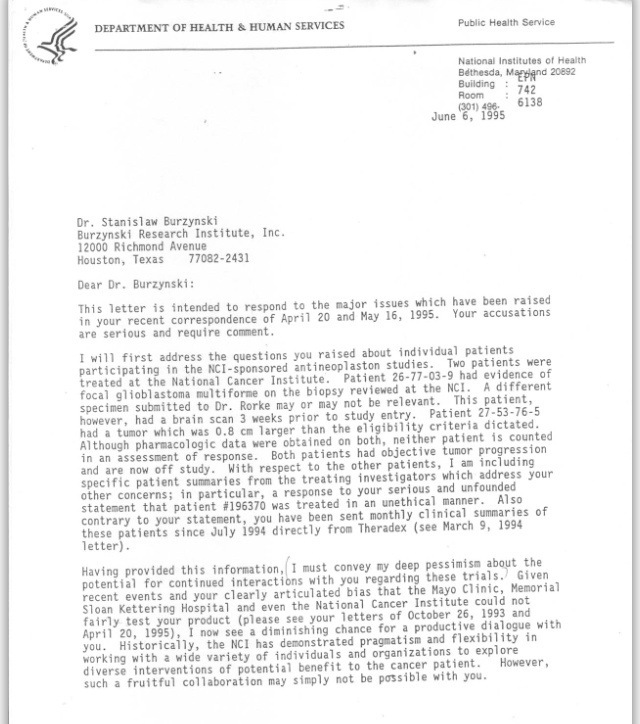 This entry was posted in Cancer Therapy Evaluation Program (CTEP), critique, critiques, critiqued, critiquing, Department of Cancer Treatment (DCT), Department of Health & Human Services (HHS), Michael A. Friedman, M.D., National Cancer Institute (NCI), National Institutes of Health (NIH), Richard A. Jaffe, Robert B. Lanman, NIH Legal Advisor, Stanislaw Rajmund Burzynski and tagged "(3) makes or uses any false writing or document knowing the same to contain any materially false fictitious or fraudulent statement or entry”, "18 USC § 1001 – Statements or entries generally", "18 USC § 1001", "2 patients were treated at the National Cancer Institute”, "attorney Richard A. Jaffe Esq. ", "break the law", "Cancer Therapy Evaluation Program (CTEP)", "Critiquing: Dr. Michael A. Friedman Dr. Mark G. Malkin Dr. Mario Sznol Robert B. Lanman Memorial Sloan-Kettering Cancer Center Mayo Clinic Department of Health & Human Services (HHS) Public Healt, "Department of Health &Human Services (HHS)", "detailed records of the patients treated in the National Cancer Institute sponsored trials of antineoplastons“, "Did Dr. Michael A. Friedman FIB ? 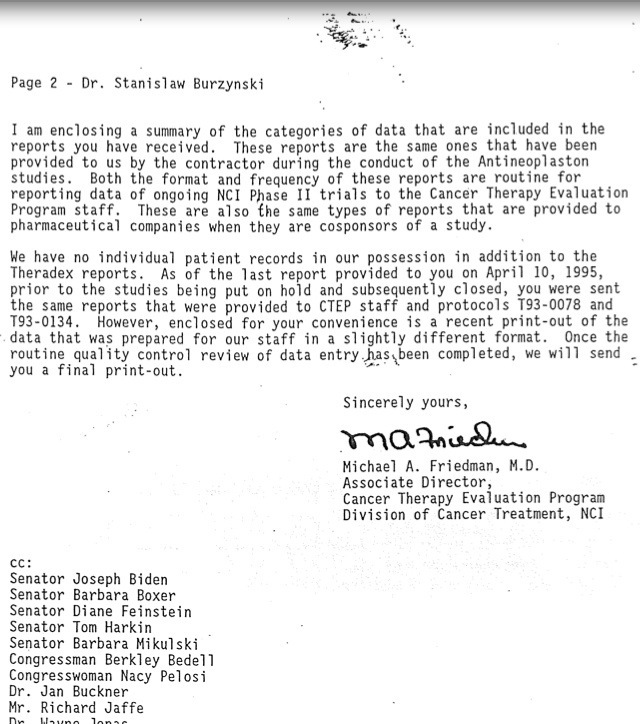 ", "Division of Cancer Treatment (DCT)", "Dr. Burzynski", "Dr. Michael A. Friedman Associate Director Cancer Therapy Evaluation Program (CTEP) Division of Cancer Treatment (DCT) National Cancer Institute (NCI) Department of Health & Human Services (HHS) , "Dr. Michael A. Friedman Associate Director", "Dr. Michael A. Friedman", "Dr. Michael Friedman", "has medical records for those 2 individuals”, "medical record", "Michael A. Friedman M.D. Associate Director Cancer Therapy Evaluation Program (CTEP) Division of Cancer Treatment (DCT) National Cancer Institute (NCI) Department of Health & Human Services (HHS), "My primary obligation is to the American public", "National Cancer Institute (NCI)"? 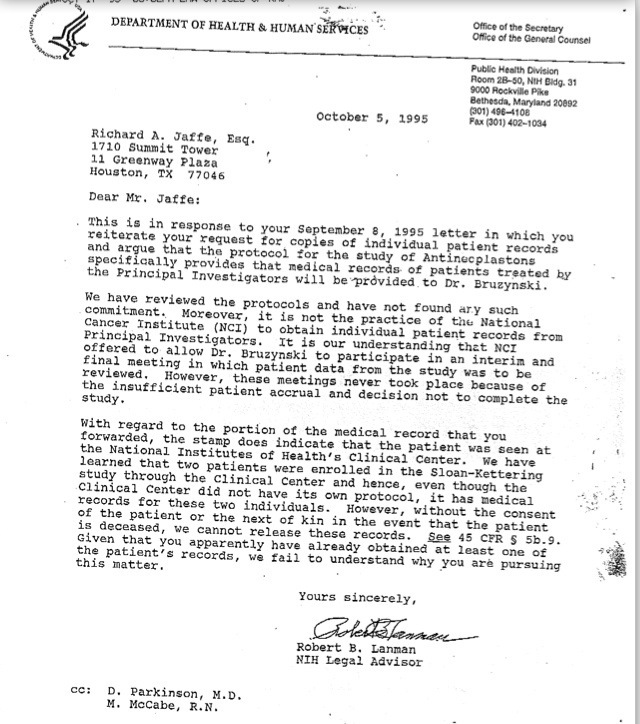 “any individual patient records” for those 2 patients", "National Institutes of Health (NIH) Legal Adviso Robert B. Lanman", "National Institutes of Health (NIH) Legal Advisor", "National Institutes of Health (NIH)", "National Institutes of Health’s Clinical Center", "patients treated", "presumed to know the law”, "Principal Investigators", "Richard A. Jaffe Esq. 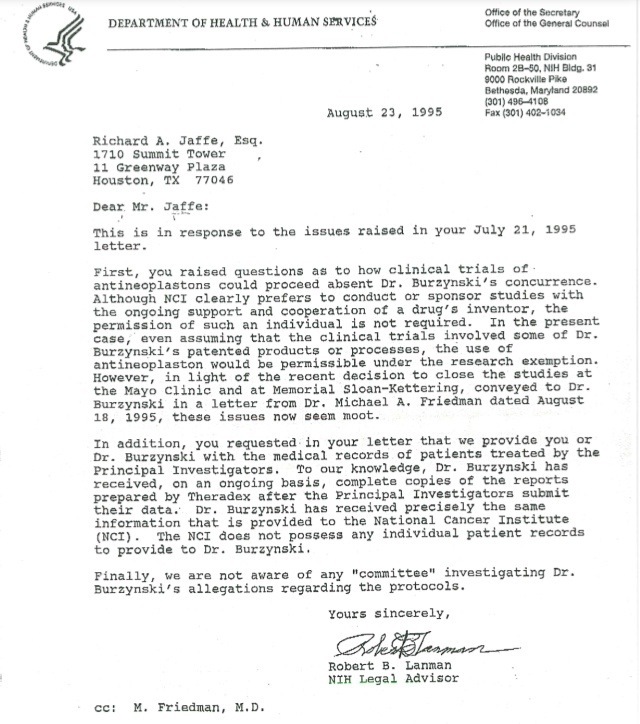 ", "Robert A. Lanman", "Robert B. Lanman National Institutes of Health (NIH) Legal Advisor Department of Health & Human Services (HHS) Office of the Secretary Office of the General Counsel Public Health Division", "Robert B. Lanman", "the National Institutes of Health’s Clinical Center", "Title 18 Part I Chapter 47 § 1001", "We have no individual patient records in our possession", "written statement", Americans, antineoplastons, “could not responsibly act in any other manner”, “individual patient records", “individual patients participating in the NCI-sponsored antineoplaston studies“, “Patient 26-77-03-9", “Patient 27-53-76-5", “We have learned that 2 patients were enrolled", “We have no individual patient records in our possession in addition to the Theradex reports”, Esq. 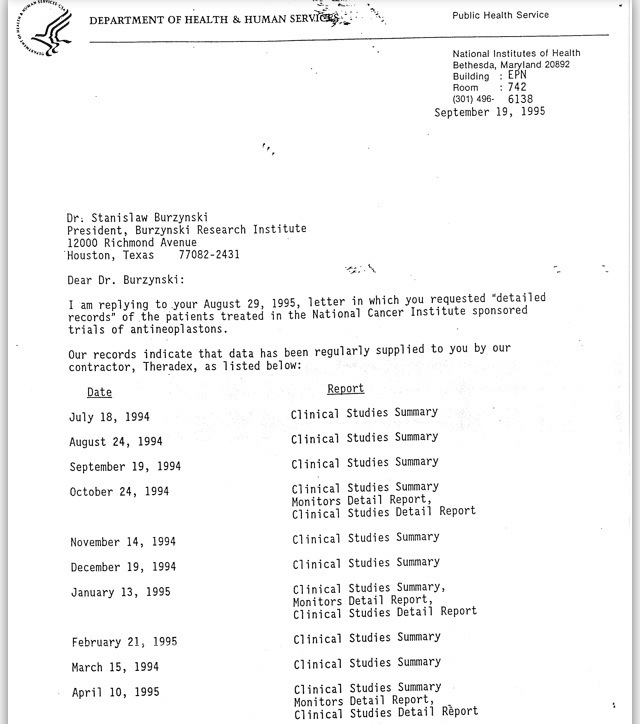 ", HHS, http://www.law.cornell.edu/uscode/text/18/1001, https://stanislawrajmundburzynski.wordpress.com/2013/09/08/critiquing-stanislaw-burzynski-on-the-arrogance-of-ignorance-about-cancer-and-targeted-therapies/, lie, National Cancer Institute, National Cancer Institute (NCI), National Institutes of Health, NCI, NIH, protocols, Public Health Service", Richard A. Jaffe, TRUTH by didymusjudasthomas. Bookmark the permalink.